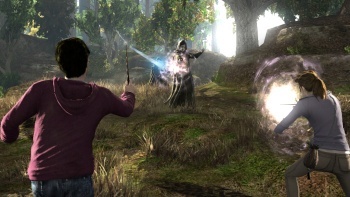 Harry Potter fans can fling spells and cast shields in an exclusive Kinect-powered challenge mode for the Xbox version of Deathly Hallows. Although Wii owners are used to motion controls in their Harry Potter games, players on other consoles have had to make due with thumb sticks. This time around, it seems that Xbox 360 owners will get a taste of the hand-waving action. During its press conference today at the Gamescom convention, EA brought James and Oliver Phelps - who play the Weasley twins in the Harry Potter films - on stage to demonstrate an exclusive Kinect-powered dueling mode for the Xbox 360 version of Harry Potter and the Deathly Hallows - Part 1. This challenge mode, which can be played alone or with a friend, is similar to an on-rails shooter. Players automatically move from location to location, dueling with rival mages along the way. Combat is powered by the player's movements - moving your arms to match a specified pattern might fling a fireball while casting your palm forward will generate a temporary forcefield. As you rack up points defeating these wizards, your scores will be uploaded to Xbox Live leaderboards. Harry Potter and the Deathly Hallows - Part 1 will hit stores this November for the PC, PlayStation 3, Xbox 360, Wii and DS.